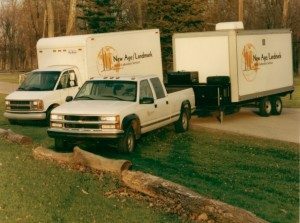 New Age Laboratories (NAL) offers superior testing through each of its mobile laboratory units. Each laboratory in our fleet is designed, equipped, and organized to perform exceptional analysis as well as staffed with degreed and experienced chemists. The layout of each laboratory is intended to promote efficient operation of instrumentation and cooperation between chemists and technicians when applicable. Employing a fleet of six state-of-the-art mobile laboratories, NAL’s chemists utilize gas chromatography (GC) and GC/mass spectrometry (GC/MS) for quantification of volatile organic compounds (VOCs), polynuclear aromatics (PNAs), base neutral acid compounds (BNAs), gas and diesel range organics (GRO and DRO), polychlorinated biphenyls (PCB), explosives, and pesticides. For the analysis of trace metals NAL chemists utilize ICP/OES and Cold Vapor Mercury Analysis System instrumentation. No mobilization charges anywhere in the contiguous United States when you use New Age Laboratories’ mobile labs! Mobile laboratory services and units provided by NAL are priced by the day with hourly charges for our on-site chemist while fixed labs typically charge on a per sample basis. Mobile lab results can be provided in an hour or up to 24 hours compared to the 5-7 day turn-around times associated with most fixed lab services. Utilizing a mobile laboratory, you gain the benefit of faster results and a higher capacity for testing in addition to the convenience. By eliminating built-in transportation delays, mobile lab services expedite results and allow you to test samples in bulk at the agreed upon daily and hourly rate. In fact, New Age Laboratories encourages its clients to run samples in higher volumes. When clients are able to keep their sample numbers up – thus reducing the price per sample breakdown – the mobile lab can actually be less expensive than fixed lab services, while achieving more data points. When using a fixed lab, samples must be sent to an off-site lab. With NAL’s mobile fleet, we bring the lab to the samples – at no cost. New Age Laboratories does not charge clients transportation fees; the cost is the same whether you’re in Maine or Louisiana! If you have a national client base you can depend on NAL to provide you with the same quality of service from coast to coast. Unlike our larger competitors, New Age Laboratories doesn’t shy away from short-term projects. We are eager to help with your next project whether its for the day, a week, or as long as you need our on-site services. Learn about our lab information management system or contact us today to get started! Why Outsource Your Lab Services? Whether fixed or mobile, there are many reasons to outsource your laboratory testing. Degree of variability in your sample flow (e.g. Seasonality). Wide variety of products, ingredients, and tests to perform. Customers who are not satisfied with internal lab’s performance. Lack of confidence in the quality of your internal lab’s test results. Initial and ongoing costs of accreditation.